As we're now mid-July (how did that even happen?!) I think it's safe to say summer is well and truly here. One of my favourite things about this time of year is going on nights out and getting glammed up - as fun as it is during the cooler months, there's just something about summer evenings sitting in beer gardens wearing pretty floral dresses - or, even better, getting dolled up every night on holiday - that makes me oh so happy. The most expensive of the three I tried was TempleSpa's offering, described as 'a cocktail party for the skin'. It comes in a sleek plastic tube with a pump for easy application, and has 'photo-reflecting' agents that it claims help bring 'life-giving radiance' to your skin. The first thing that hit me about this one is just how incredible it smells. I wasn't expecting much in the scent department for any of these oils as I see them as more of a cosmetic product than anything else, but I was totally blown away by this. An aromatic mix of mimosa, honey, bitter orange, green florals, sandalwood, oakmoss and sweet musks, it's such a treat to apply and could honestly be used in place of a perfume. The negatives? Well, this one is seriously lacking in the shimmer department. It's definitely more of a gel-oil than the other products, and whilst it does give a hint of glow it is just that - a very, very subtle hint. You really have to look to find the shimmer, which for me is really disappointing as I want ALL the shimmer when it comes to a product like this. Such a shame, as it definitely wins in terms of nourishment and scent! A slightly lower price-point than the TempleSpa product, NUXE's Huile Prodigeuse is great because it's not just for your skin. You can use this on your face, body and even your hair, something which I definitely think I would like to try of an evening on holiday! This one comes in a square glass bottle, which makes it slightly impractical for travelling, and you have to pour out the product onto your skin. Thankfully it comes out slowly otherwise it would definitely make for a very messy application! This oil contains six previous plant oils, claims to nourish, soften and illuminate and definitely ups the shimmer factor - making it much more what I was expecting from this kind of product. The shimmer is a really nice warm copper-gold which looks great on the skin without being too much - it's subtle yet shimmery enough to notice. Scent-wise it smells good, but nowhere near as beautiful as the TempleSpa product. 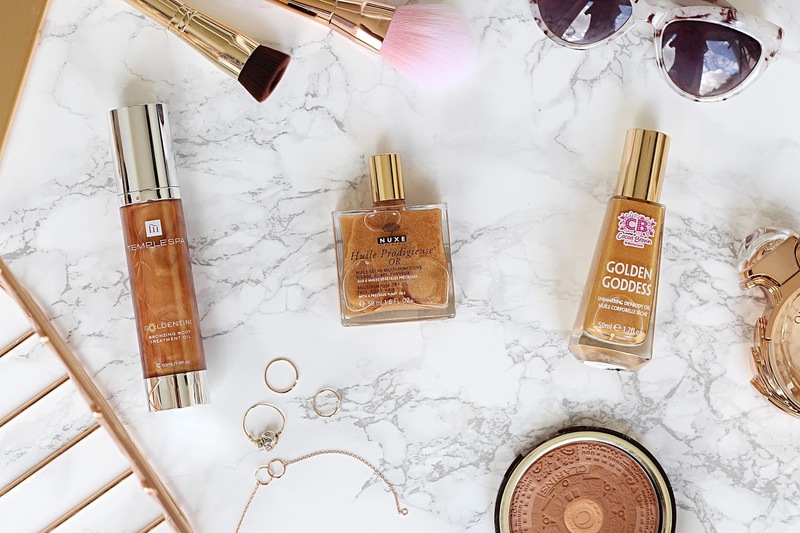 Finally, Cocoa Brown's Golden Goddess Shimmering Dry Body Oil is the cheapest of the bunch and by far the one with the most shimmer pay-off. Like the NUXE oil, it comes in a glass bottle but thankfully has a pump for easy application. Its shimmer is very golden (hence the name) and looks so beautiful on tanned skin. It has a pleasant scent (again, nowhere near as nice as the TempleSpa oil) and contains coconut oil, but other than that I don't think it really has many nourishing skin benefits. This is definitely the best one aesthetically - if you want to go all-out on a night out with the shimmer, this one would be your best choice. Plus, it's a great price! Overall I think all of these oils are great in their own way - the TempleSpa product would have been incredible if it weren't for the fact it contains little-to-no shimmer, and the Cocoa Brown oil would tick all the boxes if it had some more nourishing benefits. I think the NUXE offering is probably the one that ticks every box to an extent, as it smells good, has good nourishing qualities and a good amount of shimmer. That being said, I think the one I'm most likely to reach for would be the Cocoa Brown product - for me it's really about how the product looks on the skin and whilst I probably preferred the more copper tones of the NUXE oil, the pay-off of Cocoa Brown's product edged it for me. I think my perfect combo is going to be mixing a bit of Cocoa Brown in with the TempleSpa product so I get the scent, the nourishing benefits AND the shimmer pay-off. Phew! Have you tried any shimmering body oils? Let me know!